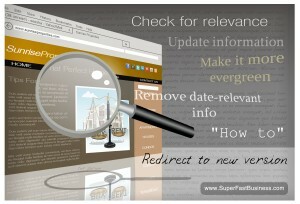 Keep your website content relevant with these steps. It might be time to detune that page a little bit. [Click To Tweet]. There are certain things that don’t really change overtime. [Click To Tweet]. One thing you should be doing with your old posts and pages is to go and have a look at how relevant they are. If something’s really irrelevant now, if it’s really old, then perhaps it’s best just to redirect that page to a newer version but a lot of pages can be renovated. This is where you have a look at the page title, the page description and then the on-page content and then you update it. Update things that have changed in the marketplace. When you’re doing that, also have a view to how you could make this content more evergreen. Could you make the update now that will make it more timeless? There are certain things that don’t really change overtime or certainly for the next few years so it’s a good opportunity to get your site evergreen. That means removing things that are specifically date relevant, if possible. Probably the best topic for that is a how-to. How-to topics that answer common customer challenges are really good so maybe you can repurpose existing or out of date posts with some how-to content so that they stack up. And in the case where it’s just not savable, just redirect that page or post to a new version or your best page that converts well so that you can at least funnel that traffic to where it should be going now. And if the page or post is really old and you’re doing old SEO which is putting a lot of instances of the keyword, sprinkling it before the article, and sprinkling at the end of the article, it might be time to detune that page a little bit. Take out some of those keywords and make it far more relevant. it was recommended back a while ago to have the target keyword phrase around 4 times on the page. roughly once at the start, twice throughout, once at the end. are you saying even this might be too much now you think? Grant yes this not advisable. it has not been best practise for years. Ensure you have the keyword once in the page title and make sure the content is relevant. That is all you need.